Yet along with the humor, Viets also offers a sobering sub-plot on how to deal with a parent’s alcoholism and death. This serious aspect works, adding texture to Viets’ plot and putting a realistic spin on the story. Viets skillfully balances humor with the thoughtful in Murder With All the Trimmings." Welcome to the hilarious and wonderful Elaine Viets...we're happy to say she's healthy and glowing and writing like mad. It's election day, yes, so go vote. 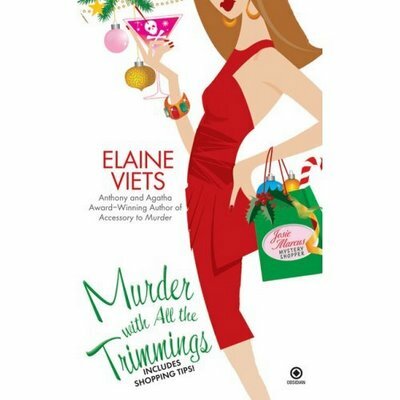 But its also LAUNCH DAY for Elaine's newest mystery, MURDER WITH ALL THE TRIMMINGS. And we're all voting yes for that. As you know, Elaine has written four Josie Marcus Mystery Shopper novels. She is also the author of seven Dead-End Job mysteries, including "Clubbed to Death," which Marilyn Stasio of the New York Times called "clever." She's written numerous short stories, which have been published from Japan to Germany, and won the Anthony, the Agatha and the Lefty Awards. The Lefty, given for the funniest mystery at Left Coast Crime, was an engraved pick ax, making it a genuinely lethal mystery award. Elaine is genuinely lethal, too. Lethally funny. And here she is all the way from Florida, where hanging chads are long longer a problem. HANK:. Is writing the mystery shopper series just a way for you to get to go shopping and call it research? Or does the research get in the way of your shopping? Or do you not like shopping at all? ELAINE: Don't tell anyone, but I don't like to go shopping. Looking into dressing room mirrors takes more courage than I have. Also, I used to sell dresses at a mall store, and I , uh, lied to make a sale. "Yes, ma'am, Nile green is a very unusual color," I'd say. Of course, it made the woman look like a corpse, but I left out that part. As punishment for my retail sins, I am unable to believe any salesperson. I take my husband with me to shop because he will tell me the truth. HANK: Having a mystery shopper as a main character -- someone whose always undercover --is such a terrific idea. How'd you come up with it? ELAINE: My publisher asked me to do a mystery shopper series. My mother used to mystery shop with her best friend, so you could say I grew up with the subject. Mom didn't wear the disguises that Josie wears in my books. Mom always said that being a housewife made her invisible. HANK: Your mysteries always have a timely theme...you don't bonk readers over the head with them, but they're an essential part of the story. Do you come up with that theme first? Something you feel needs to be said? Or is it what emerges as you tell the story? ELAINE: The theme emerges as I write the book and do the research. My upcoming Josie mystery is about puppy mills. I'm from Missouri and I'm sorry to say that my home state is a puppy mill haven. Novels, if they aren't too preachy, are a way to gently educate the public. I developed the generational aspect -- grandmother, mom and daughter living in one house -- because I wanted to get away from the childless heroines of my other books. Josie Marcus is a single mother who cannot make it on her own without help from her sometimes irritating mother. In today's difficult economic situation, two and three generations often pool their resources to survive. Many working parents cannot afford child care, and depend on their families for help. -- Josie has to mystery shop during the Christmas season, which wears down even a shopping pro. -- For nine years, Josie avoided telling her daughter, Amelia, the truth -- Josie never married her child's father. She implied that Nate is dead, when he was really just dead to Josie. In fact, Nate was a drug dealer. Josie thought he was safely in prison, until he turned up on her doorstep drunk -- with a lot of dubious cash. -- Josie has to deal with pornaments -- pornographic Christmas ornaments. HANK: Pornaments! I am laughing so hard..I can barely type. ELAINE: Yes, they really exist. If I tell you one is called "snow job," you'll get the idea. Worse, these pornaments are sold by Doreen, the ex-girlfriend of Josie's current love. Josie tries to get out of mystery-shopping Doreen's store, but Harry the Horrible, Josie's evil boss, forces her to do it. HANK: Pornaments. I can't get that out of my mind. But I'll try. Anyway--shopping. If something goes on sale the week after I buy it at full price, that's the worst. (I suppose the best solution is never to buy anything full price.) But if I pay too much--I just ask for an adjustment. I know you always have tips...what's your latest favorite? You can also get on your favorite stores' mailing or email lists, and they'll alert you to the big sales. Black Friday Bargains: Brave souls get up at four a.m. the day after Thanksgiving and shiver in the cold for those special holiday prices. If you're one of them, make sure you’re waiting for something that's in stock. Call the store before the sale and find out how many units are in stock. If the store only has four or five flat panel televisions at that incredibly low price, you may decide you want to sleep late Friday morning. Better yet, sit tight until the last two weeks before Christmas, when you’ll see real deals on TVs, computers, electronics and other gifts. The lines are shorter, too, except maybe on December 23, which is probably the busiest shopping day of the holiday season -- not Black Friday. HANK: And shall we ask the JR's for their favorite shopping tips--and then urge everyone to get to the polls! ELAINE: By all means! Let's hear your tips! CONTEST TIME! We're giving away two signed copies of Murder with All the Trimmings! All you have to do is comment and leave us a shopping tip-- and we'll choose a winner at random. Contest goes today and tomorrow...when Elaine will return to take the Jungle Red Quiz! And to give us the special scoop on the new-new Josie. Elaine will discuss Murder with All the Trimmings at 7 p.m. Friday Nov. 7, at Murder on the Beach, 273 Pineapple Grove Way, Delray Beach, 561-279-7790, and from noon to 2 p.m. Dec. 6 at Barnes & Noble Plantation, 591 S. University Drive, Plantation, 954-723-0489. Welcome to Jungle Red. I'm with you on never believing a salesperson. My daughter, who worked for a while at a hot boutique said she'd was pressured to say anything to make a sale. And a friend's daughter revealed that she once told a shopper the buttons of the sweator matched her eyes -- because it was the only positive thing she could said about the incredibly ugly sweater! And I'm pretty sure, I'll be giggling about pornaments all day, too. I accidentally bought a pornament one year...it was a cute, wooden Santa, but it wasn't until I brought it home and hung him on the tree that I realized there was something, well, off, about him. Upon closer examination, I saw that someone had written on him! Something to do with "bone" and "ho"....needless to say, he is no longer on our tree. So my shopping tip is to suggest that you examine your ornaments and other holiday display items closely, lest you end up with a pornament yourself! Hi Elaine, what a lovely surprise to find you on Jungle Red this morning! There is a small dress shop in the next town over and those salesladies have actually told me when something looked appalling! But that's relationship-based sales, right? If they sold me something hideous, chances are, I wouldn't come back. My latest obsession (and I know I'm late for the party) is bidding wars on Ebay. Maybe that could be in Josie's future! Good luck with the book. You are a wonderful role model in this business--a good writer who's overcome amazing odds in many ways! Hooray for Elaine! ps if you have time today, will you tell us a little about your writing schedule? Thanks, Jan. I love the line about the buttons matching the woman's eyes. It's a good thing I didn't know it when I was in retail. Jessica, I'm still laughing about your Santa ornament with the extra features. And Roberta, take good care of that store. An honest saleswoman is worth her weight in credit card slips. Thanks for stopping by, Elaine. I entertained the idea of becoming a mystery shopper for a while -- until I saw the list of local opportunities. Lotsa tires and eyeglasses. Shopping tips - eat a good breakfast with a nice protein source before you set out. (BTW, Starbucks has a great high-protein box breakfast, if you're on the go.) That way, you'll be less vulnerable to that tantalizing aroma wafting toward you from Cinnabon. Oops. I got to talking and forgot to answer Roberta's question. I usually get up about 7 a.m., when the cats demand breakfast. Harry in the photos is my fur-covered alarm clock. I start writing around 9 a.m. and I'll keep at it until about noon, then break for lunch and write until 3 or 4 in the afternoon. Speaking of writing -- I really liked Roberta's "Preaching to the Corpse." A truly cozy read for a cold winter day. That's my other shopping method, Mare. If I'm buying something important, like a suit or dress, I bring my husband, Don, along. We've been married 37 years and he knows how to tactfully answer questions like, "Does this make me look fat?" He says, "It's a beautiful outfit, but you don't look your best in it." Is the man a diplomat or what? When the mission is complete, he earns dinner a restaurant, since my cooking is lousy. I agree, Rhonda, the blood sugar thing is critical. I always bring almonds. My shopping tip? Keep your receipts in a special box or bag. Always put them there. And if you find a good white t-shirt, buy three. My shopping tip is to avoid malls under any condition. The local consignment shop, K-Mart, the Talbots down the road, Marshalls - they're all ways to avoid the mall. My idea of perfect Christmas shopping is to never go to the mall. Online shopping is OK, but not if I have to try something on, like shoes and pants. On the other hand, if I need to find the most affordable, say, "petite black slacks that look good with this tweed blazer for an upcoming job interview," then I might just hit the Petite section of every store in the mall to make my search more efficient. And if I park as far away as possible, then I get my daily long walk in, as well! I haven't read your books yet, Elaine, but look forward to doing so. Buying three good white T-shirts is not a shopping disorder, Hank. It's an important fact of shopping lives. Certain clothes and colors are stain magnets. When I wear a white T-shirt, it immediately breaks out in red sauce stains. I used to have a powder blue skirt that was a coffee magnet. Pornaments! I'm so intrigued I might have to google that - though my husband might then wonder what he is getting for Christmas if he sees that! My shopping tip is to never bring a husband, but always bring a mother:) My mum is the best at finding bargains, encouraging me to buy, saying I look great (or not - she's honest!) and we get to gossip the whole time. My husband hates shopping so I'm happiest when he isn't next to me demanding as soon as I get into the store "what do you need to buy here?!" Okay, Elaine. Whew. But come see my closet, then tell me. "That's a ball-point pen magnet!" I told her. I laughed all the way out the door. Well, Hank, I have to confess. I once bought a yellow linen dress with daisies around the collar (freakin' daisies -- and I'm six feet tall) because she told me it made me look top-heavy. At that time, I didn't have enough top to justify that remark. Thanks for the fun interview, Elaine. You know, I've been wondering what to get my father-in-law for Christmas. Pornaments might be JUST what I was looking for! My shopping tip is this: Don't buy any new brand names without searching for them on eBay first. Honestly, you can find the same Coach purse, designer fragrance, or Tiffany key chain for much less. And to make sure you're buying from a trustworthy seller, check to see that they've had at least 100 positive feedback comments from buyers. I have saved hundreds by shopping on eBay in Oct and Nov and then sitting back with a good book while everyone else is scrambling at the mall. Love the cover, Elaine. Hope it sells like hot pornaments! I couldn't help it: I had to google pornament. Here's a harmless image of a GIngerbad Man! Good tip, JB, and I'm talking about shopping, not the Gingerbad Man. Yes - multiple white tees. And/or black ones, too. Black does stain, BTW. A drop of olive oil in the wrong place can ruin a shirt. I keep a Tide pen in my bag. Shopping tip: wear comfortable shoes! Everything looks crappy if your feet hurt, and you'll grab just about anything so you can go home and take your shoes off. I spent one summer selling gentlemen's sportswear in a London department store. Half the sales staff's time was spent refolding the trousers (oh, no, of course we don't use hangers!). Ingrid Bergmann came in one day and bought the ugliest shirt in the shop. Shopping hint - Do an online coupon search first for whatever stores you are shopping that day. Always take someone with you in case you run into one of those deals for buy one, get one free. Don't fall for the buy one get the second for 50% off because all that amounts to is 25% each while having to buy TWO of something you want only ONE of. Don't be afraid to ask for a discount on a damaged item or even a floor model. Love contests, sign me up! True dat, Sheila. If your feet hurt, you don't care what's in the shops, where else you need to go or even if you've made a dent in your list. Loved the London story, BTW. Sounds very glam. Debbie said, "Don't fall for the buy one get the second for 50% off because all that amounts to is 25% each while having to buy TWO of something you want only ONE of." 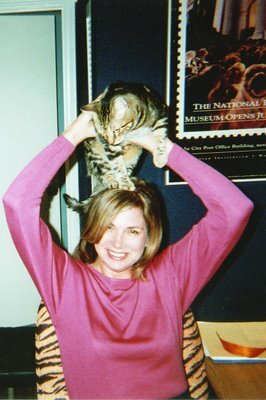 So that explains how I wound up with a mustard-colored blouse. There's still time to enter the contest for Elaine's book! And tomorrow, even more info from Elaine. Something or other about a tattoo, and being arrested. I could have it wrong. Thursday! Sing it with me: Down by the river..down by the banks of the River Charles.. Nefarious doings in the locker room with Mary Ann Tirone Smith and Jere Smith... we'll let those two explain. And give away a book! And Friday--after election fever is over, Clare Langley-Hawthorne will reveal the sad sad story of how she got left out. And again--another contest! That Marilyn Stasio is so smart--Elaine writes the cleverest (is that a word?) books on the planet! 1) Never settle! I live in a small-town shopping desert and every time I buy something that's "almost" what I'm looking for at our incredibly lame Macy's, I regret it. Much better to wait until you can find just the right thing than to put something disappointing in one's closet. It's sure to remain in there. 2) When it comes to gifts, listen to people when they say what they want. My mother told me one year that she wanted a couple rolls of those "Forever" postage stamps for her birthday and I thought it was the silliest request ever. But when she opened them her smile was bigger than when I made her pottery mushrooms in fourth grade. Go figure.